It's been absolutely freezing for the past week or so. Bundling up is necessary as well as diving into a sea of covers as soon as I get home each day. I really try to work at my desk when working on Summer Wind because I think I am more organized and productive at my desk-- but when I get home from work at night, sometimes the last thing I want to do is sit at a desk for a few more hours. 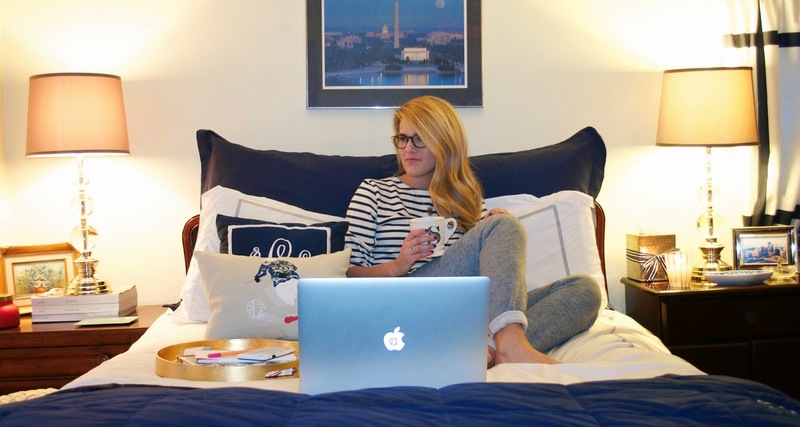 When I'm working in my bed, I always have hot tea (refresh mint by Tazo) or a decaf Nespresso (the bright red pod) to warm me up, the coziest of outfits (see post about the best sweatpants, here), and a great playlist going. It varies between bubbly pop that I can belt out while working or if I need to be serious, I throw on some Wynton Marsalis on Pandora. I have recently added a fun new 'winter' throw pillow to my bed from Huger Embroidery. I'm actually about to get a king bed, so I wanted to add another throw pillow into the mix, so when I switch to my new bed, it will fit right in! 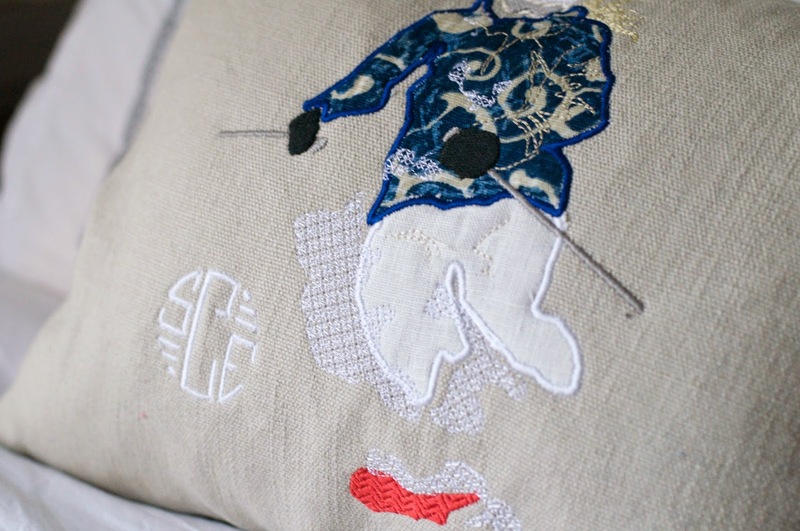 Sarah Gibson Wiley is an artist based out of Richmond, VA and creates custom embroidered heirloom pillows and portraits (see more photos here). 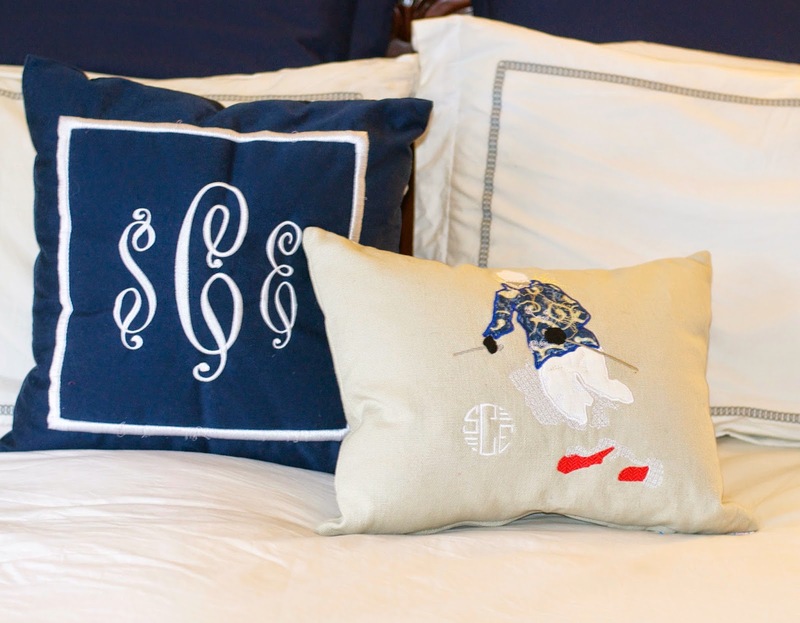 She created this pillow for me based on my monogram, my love for skiing and my bedroom color palette. The pillow is gorgeous and truly something I'll have forever. I love that she does dogs-- thinking Mac would look very handsome on a pillow :) Would also make for a perfect gift for newlyweds or new homeowners. 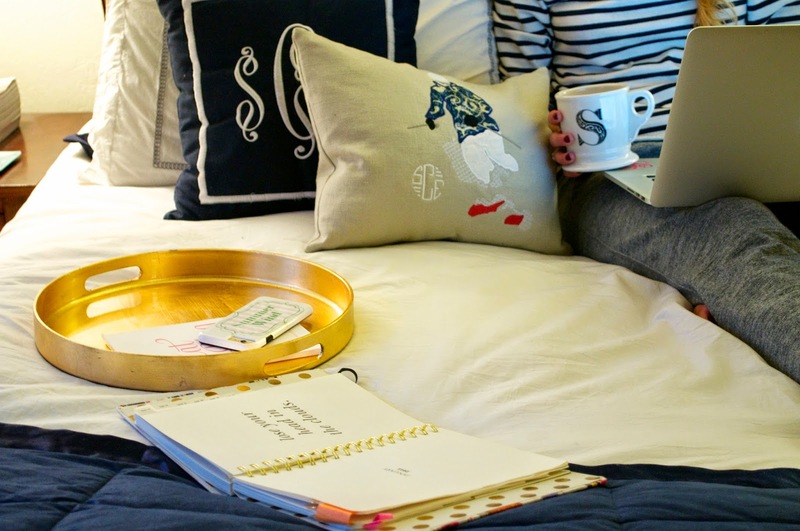 Are you ever guilty of working from bed... please tell me I'm not the only one! Have a fabulous day! No judgement here! I have been blogging from my bed for the past month as well haha! Thank you for sharing! We LOVE the design! Loved this post! Your bed space is absolutely adorable! -Cheers to a great year! Oh I am all too guilty for blogging from bed as well! It's the same for me, after spending an entire day at my desk at work the last thing I want to do is sit at my desk again. My bed almost calls to me, beckoning with my pillows! You are definitely not alone! I've also been blogging from my bed! Currently lying in bed while commenting on blogs and writing up some posts. You are definitely not alone!! I love this but I'm really obsessed with that little, gold tray! I always want to relax in my bed with tea or coffee so I think having a little tray like that would be so beneficial! Happy 21st Birthday Cow Cow!!!!!!!!!!!!! !